View More In Rotary Lasers. The Leica Rugby 620 is a self-leveling horizontal and manual single axis slope laser up to 8%. After 30 seconds of operation, the Rugby H.I. Alert activates (height of instrument) so if it is bumped or disturbed without you noticing, the unit will stop rotating and displays a visual and audible alert notifying you that something has changed. This eliminates costly mistakes if the unis is moved. 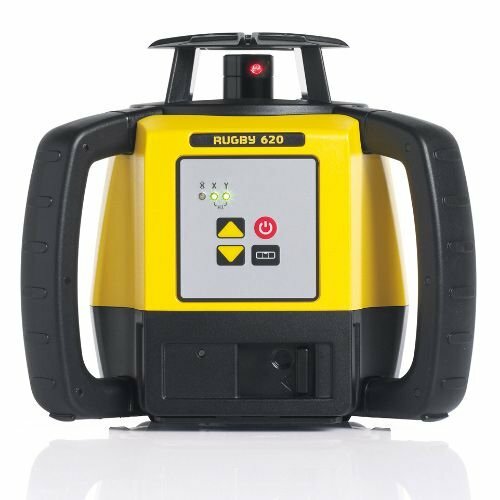 The laser on the Rugby 620 is red visible class 2, 635nm with an output not to exceed 2.7mw. Working range is 2,000ft with the Rod Eye Basic receiver and 2,600ft with the Rod Eye 140 Classic receiver. Accuracy is +/- 1/16" at 100ft. Operating temperature is 14 to 122 degrees F. The physical laser is enclosed in a heavy duty housing, meets IP67 dust/water protection standards, and is designed for rugged outdoor conditions of all types. With the alkaline battery option, you can expect 60 hours of use from 4 D-cell batteries. The Rugby laser, battery tray, and receiver all come packaged in a very rugged case for storage, transport, and the conditions found in the back of most any pickup truck at the job site. Warranty is a two year no cost period that can be extended to three years if registered within 8 weeks against manufacturer defects. If you have any questions about this product by Leica Geosystems, contact us by completing and submitting the form below. If you are looking for a specif part number, please include it with your message.